About a week ago we saw a leaked Battlefield V Firestorm tutorial video appear on YouTube. Now the Battlefield V — Official Firestorm Reveal Trailer has gone live and I was expecting a similar video, but it isn't, perhaps the tutorial will follow later. Nevertheless, the new official video is quite exciting to watch, showing battlefield combat scenes involving a diverse array of vehicles while you and your squad of teammates try to eliminate your opponents and stay away from the ever contracting firestorm's edge. In the Battle Royale mode trailer, above, you can see an accelerated battle scene as your squad parachutes into the firestorm village. Almost immediately you come face to face with a rival team and both factions run for cover in nearby buildings. Weapon fire is exchanged and the one team decides to throw a smoke grenade for attacking under cover. As they approach the enemy structure they are surprised by an artillery towing tractor bursting through barn-doors and racing away in the confusion. Later in the video we see helicopters, tanks, boats and jeeps commandeered. However, those in vehicles must be aware that they become big, noisy targets – albeit faster moving. This factor is highlighted by the appearance of a soldier with a rocket launcher. Later in the short two and a half minute feature we see the firestorm contracting – it acts to force you and / or your enemies out of cover, literally adding heat to the battle. 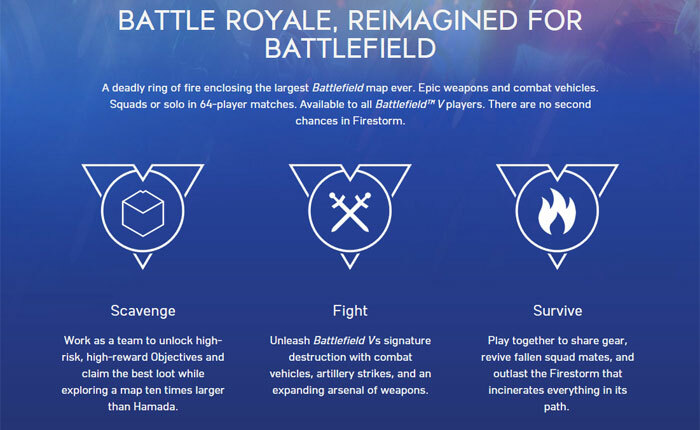 The recent leaks have indicated that the release of Battlefield V's battle royale mode has come very much closer. The official trailer adds a date for those eagerly awaiting this game mode to appear – 25th March, across PC, Xbox One and PS4. Too little too late? Unless it is free to play, I don't think many will care. We already have a mature PUBG, why would you play this instead? Cool graphics? It's free if you have BFV. Pubg is still far from polished imho and has massive issues with cheaters etc. It took a while for the battlefields devs to make this which probably means it won't have the issues that pubg has. Shame BF is generally inundated with cheaters too.